In case you haven’t already heard, mobile responsive design is kind of a big deal. All the big names in digital marketing have talked about it, but it turns out that it might be even more important than even they thought. With more and more benefits piling up behind the prospect of keeping your web properties mobile-friendly (and even more disadvantages to non-responsive design presenting themselves), responsive design is proving to be an item deserving a spot near the top of your list of priorities. Here’s why. Let’s talk for a moment about the growing body of proof that undoubtedly shows how responsive design is one of the important factors that could make or break your business online. First off, depending on your audience and industry vertical, mobile users could account for up to 70% of your email opens. And looking at regular content consumption, over 2 billion users are expected to be surfing the web via mobile by the year 2017. Furthermore, the typical smartphone user today checks their device an average of 150 times per day—that’s 150 opportunities for you to break through and convert a prospect to a customer! The list of compelling statistics goes on and on. But if they don’t convince you, just have a look at the cost of ignoring mobile. You’ve heard the case for adapting to mobile. 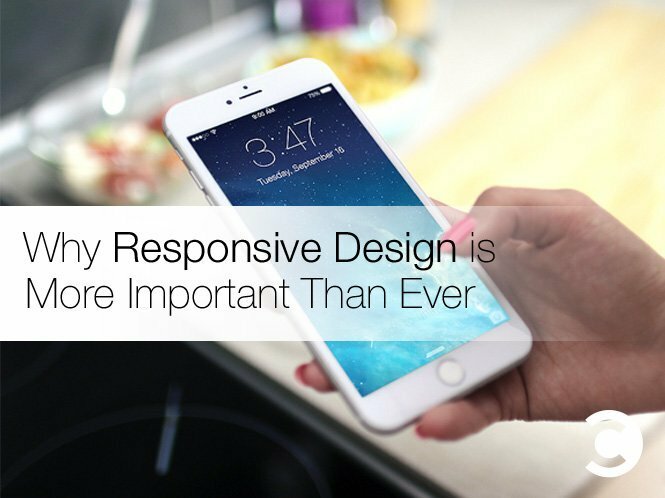 Now listen to what you’re facing if you ignore the call for responsive design. Early this year, Google announced that responsive design would become a notable ranking factor in the SERPs. And in April, the respective algorithm change to implement those sentiments was released. That means you’ll likely begin to see your rankings drop if you fail to design for your mobile users. Web users are a finicky bunch, especially when they’re looking to buy. Research reveals that webmasters have a window of 7 seconds to capture users’ attention before they click away. To make matters worse, 73% of mobile web users say they’ve run into a site that took too long to load on their phone or tablet. First impressions matter, no bones about it. And if your site isn’t set up to impart the best impression on all platforms, you’re setting yourself up for disaster. Each and every user should receive an impeccable UX and UI experience the first time they visit your site, no matter what their device may be. Are you sold on the benefit (read: necessity) of implementing a responsive design? If you’re still working with a non-responsive design, you might be starting to feel a little nervous at this point. But don’t be discouraged. You have a few different options when it comes to bringing your site up to speed with modern mobile standards. If you’re running on WordPress, making the switch to a responsive theme—and hiring a design firm to make the transition as smooth as possible—is a great option. Professionally designed themes tend to be stable, updated frequently, and rather pleasing to the eye, even with minimal customization. Regardless of your situation, this option is definitely the most expensive. However, it’s also the option that provides the highest level of customization and quality. A larger, more established business with a heavy reliance on revenue generated from their web presence can’t go wrong by building a new responsive site from the ground up, no matter the cost. For many websites, it’s possible to convert an existing website to be mobile responsive. If you have a strong brand attachment to your current site, a lot of prebuilt systems, or other assets that might make a redesign difficult, this approach may be your best bet. Having seen the ever-growing demand for responsive design, it’s hard not to acknowledge the tremendous ROI you’ll be receiving on your investment in a new mobile-friendly site. From snagging customers that otherwise would’ve bounced from your site to keeping your existing customer base happy, there’s no denying the value of a clean, effective responsive design.